We all take certain measures to prevent accidents but despite our best efforts emergencies arise. You trip and fall... unintentionally come in contact with exposed wiring... step on a rusty nail... or literarily bite off more than you can chew... And when an accident happens, time is not on your side. 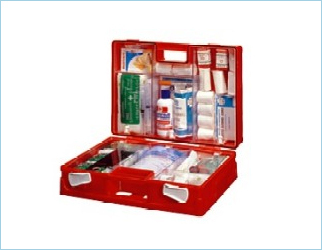 Besides a well-stocked and functional First Aid Kit, preparation and skills are the most important tools you can have at your disposal. This section of our on-line course will introduce you to a number of common emergency situations and their respective First Aid responses. A quiz at the end of the section can be used to gauge how well you've retained what you read. Feel free to return to any area of this section as many times as you feel are necessary until you feel comfortable that should an accident happen, you are well equipped to deal with it appropriately.